The sanctuary is silent and dark except for pages turning softly and six candles burning on the bima. Hour after hour, congregants come to serve as Keepers of the Flame, praying, reading, writing, honoring. 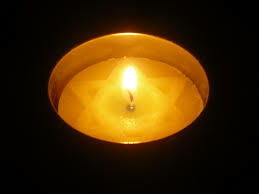 It is Yom HaShoah, Holocaust Memorial Day. 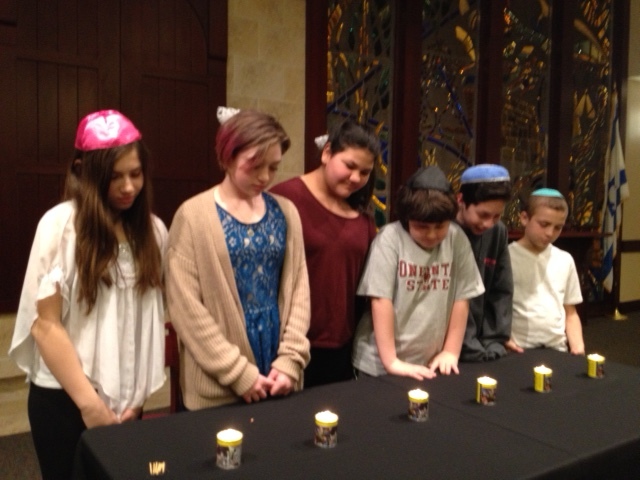 After last night’s evening minyan, the Holocaust Committee facilitated a poignant, meaningful program. Congregants spoke about the OJC Kaddish Project, explaining how they had committed to knowing the story of a child killed in the Holocaust. They chose a yahrzeit date for that child and promise to light a candle and say kaddish for him or her every year. [For more information on the Kaddish Project, contact Sandy Borowsky ojcschool@gmail.com.] Sixth graders presented their stories, reports and posters about the Righteous Gentiles they studied. Rabbi Scheff chanted El Maleh and six candles were lit to mark the beginning of the twenty five hour vigil. It is uncomfortable to be in the sanctuary at 6:00 am when I yearn for sleep, but who am I to complain when I am here by choice, when the hours of a day are all left to my discretion? It is a bit cold in the sanctuary, but who am I to complain when I can pull on a sweater, when the time of feeling chilled will soon end? It is lonely here in the sanctuary, but who am I to complain when the ones I love are safe and healthy and right where they are supposed to be? And then it is 6:45, time for morning minyan. Our prayers are an act of defiance. The sanctuary seems empty except for the ten of us. Six candles are our witnesses. We lay tefillin and daven shacharit and leyn Torah. quietly pleased, relieved that we remember. God is the True Witness. Baruch Dayan HaEmet. In ways mundane and transcendent, it is impossible to wrap my mind or my soul around the reality of the Shoah. The best path seems to stop seeking answers and focus instead on action: loving, whole-hearted actions anchored in the hope of a better world.